SERVICE - GOLF CARS UNLIMITED, LLC. SERVICE: Golf Cars Unlimited service department is well staffed and has experience in the repair of most make or model golf carts. Our technicians are able to diagnose mechanical and electrical problems quickly and offer advice to effectively and efficiently correct any problems. 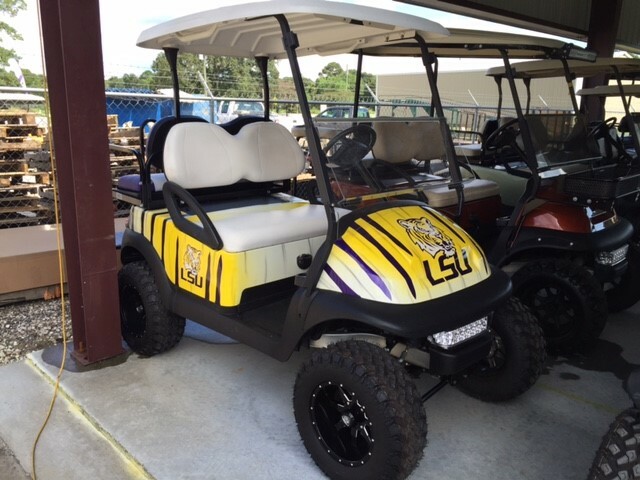 We can also fabricate almost anything specifically requested for your golf cart needs. We can come to your location, pick up your cart, service it and deliver it back to you, for a nominal fee. Golf Cart Charger Will Not Turn On The most frequent question we get concerning problems with electric golf carts is a suspected Bad charger. The scenario is usually the same – something along the lines of not using the golf cart for a long period of time and the golf cart batteries are dead and the charger refuses to charge the batteries - the overwhelming majority of the time it is the batteries. If your batteries have been unused for awhile and are discharged, the charger will not detect them and will not be able to charge. If you a voltage meter and each battery has the correct voltage, then you have a charger problem. If they are reading low voltage then your batteries are probably still good. The easiest way to get your batteries back on their feet is to give your batteries a little kick from a standard automotive-type battery charger. Depending on the voltage of your batteries and the type of automotive charger you have this can be easy or somewhat of a hassle. Before you get started, check your water levels but do not fill up the individual cells, just make sure the plates inside are covered and not much more. If you overlook this you stand the chance of boiling out the electrolyte and seriously compounding the problem. Assuming your charger is the typical 12-volt automotive type and you have a 48-volt system that utilizes four 12-volt batteries all you will need to do is charge each one individually for about 20-30 minutes or so. If your golf cart uses 6-volt batteries you would just charge two batteries at a time rather than individually. When trying to revive 8-volt batteries things get a bit hairy as you’re pumping 12-volts into an 8-volt container which is something you shouldn’t do for more than 15-20 minutes max. Be sure to keep a close eye on the batteries when do this and never leave them unattended. Once your batteries have absorbed a small charge your automatic charger should be able to take over, which is ideal. Many of our repairs involve the battery of the car. The battery is a vital part of an electric golf cart and can be very costly if not maintained properly. We recommend that you purchase Trojan brand batteries, if properly maintained can lasts 4-5 years, much longer than cheaper batteries. Battery acid is corrosive and can be a health hazard. When servicing batteries, remove jewelry in order to avoid contact with metal on the battery terminals. When checking and refilling batteries, put on safety glasses and heavy rubber gloves. After the batteries have been fully charged, check the electrolyte water levels in each cell of each battery monthly (depending on use) to ensure that the leaded plates in the battery are submerged in water. If the water runs dry, it will shorten the life of the battery and could be a fire hazard. Use only distilled water to refill. Don't fill the cell all the way up -- add just enough water to cover the plates. Over filling will cause the acid to flow out of covers when charging, resulting in corrosion of the metal frame and cables. Check connectors to make sure they are tight and corrosion free. If connectors are loose or corroded, contact a service technician. Connectors can also be negatively interfered by spilled battery acid, as well as dirt, dust, and grass. Use baking soda or Coke to clean acid off of the terminals. Use water to clean dirt, dust, and grass. Cleaning the top and sides of the battery is crucial for a long-term life and efficient, day-to-day performance.